DIE Lunæ, 29 die Octobris. Votes to prevent the Importation of French Commodities. L. Butler committed to The Tower. D. of Bucks committed to the Black Rod. The Lord Chamberlain reported to the House, "That, according to their Lordships Commands on Friday last, he had acquainted the King with the Business concerning the Duke of Bucks and the Lord Butler; and His Majesty returns this Answer, That He hath taken off the Restraint from the Lord Butler, and hath commanded him to attend this House this Morning, to receive their Lordships Determination." 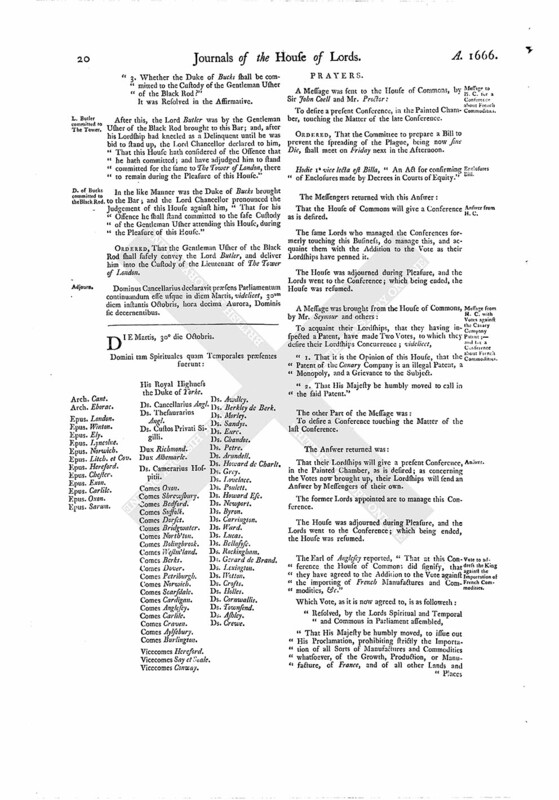 Next, the House took into Consideration the Effect of the late Conference with the House of Commons, concerning the Votes for inhibiting the Importation of French Manufactures and Commodities, &c. and agreed with the House of Commons according to their Desires. 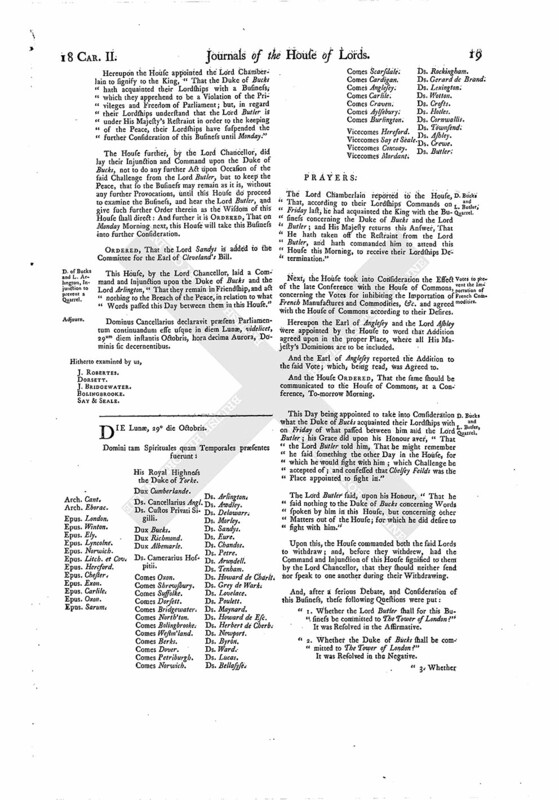 Hereupon the Earl of Anglesey and the Lord Ashley were appointed by the House to word that Addition agreed upon in the proper Place, where all His Majesty's Dominions are to be included. And the Earl of Anglesey reported the Addition to the said Vote; which, being read, was Agreed to. And the House ORDERED, That the same should be communicated to the House of Commons, at a Conference, To-morrow Morning. The Lord Butler said, upon his Honour, "That he said nothing to the Duke of Bucks concerning Words spoken by him in this House, but concerning other Matters out of the House; for which he did desire to fight with him." Upon this, the House commanded both the said Lords to withdraw; and, before they withdrew, had the Command and Injunction of this House signified to them by the Lord Chancellor, that they should neither send nor speak to one another during their Withdrawing. "1. Whether the Lord Butler shall for this Business be committed to The Tower of London?" "2. Whether the Duke of Bucks shall be committed to The Tower of London?" "3. Whether the Duke of Bucks shall be committed to the Custody of the Gentleman Usher of the Black Rod?" After this, the Lord Butler was by the Gentleman Usher of the Black Rod brought to this Bar; and, after his Lordship had kneeled as a Delinquent until he was bid to stand up, the Lord Chancellor declared to him, "That this House hath considered of the Offence that he hath committed; and have adjudged him to stand committed for the same to The Tower of London, there to remain during the Pleasure of this House." In the like Manner was the Duke of Bucks brought to the Bar; and the Lord Chancellor pronounced the Judgement of this House against him, "That for his Offence he shall stand committed to the safe, Custody of the Gentleman Usher attending this House, during the Pleasure of this House." ORDERED, That the Gentleman Usher of the Black Rod shall safely convey the Lord Butler, and deliver him into the Custody of the Lieutenant of The Tower of London. Dominus Cancellarius declaravit præsens Parliamentum continuandum esse usque in diem Martis, videlicet, 30um diem instantis Octobris, hora decima Aurora, Dominis sic decernentibus.